The datasets used for National Audit of Breast Cancer in Older Patients (NABCOP) are detailed in the NABCOP Combined Data Specification, and are supplied by the national cancer registration services. The English dataset is provided by the National Cancer Registration and Analysis Service (NCRAS). 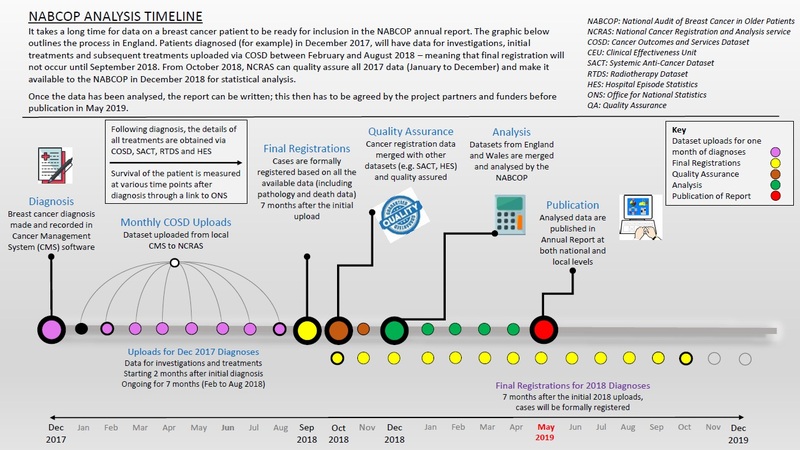 A graphic representation of the NABCOP Analysis Timeline, based on receiving the English dataset from NCRAS, is available to download. More detail about the movement of data from the cancer registration services is provided in the NABCOP data flow diagram.